Peru’s economic growth is expected to accelerate in 2015 spurred by lower interest rates, two mega mining projects, strong demand and public investment in infrastructure projects. The 2011 presidential elections resulted in the victory of the Gana Peru alliance, headed by Ollanta Humala, a former army officer. Despite its original left-wing programme the Gana Peru administration turned out to be pragmatic and continued the economic policies of the previous government while putting more emphasis on tackling social issues. Despite remarkable economic progress made in the last few years, the country still has to cope with high poverty and very large income inequalities, especially between the coastal and the heartland regions. There are still social conflicts flaring up, especially in the vital mining sector. Lack of effective state control in some remote areas remains a challenge for the government, enabling illegal business activities (contraband trade, coca-leaf farming), and some radical groups to promote social unrest and to disrupt business. Peru’s small, open economy is highly dependent on minerals (copper, gold, oil and gas), which account for more than 60% of exports. Due to this dependence and a large informal economy (more than 50% of the workforce), high corruption and poor governance in the public sector Peru´s economic structure is rather weak. 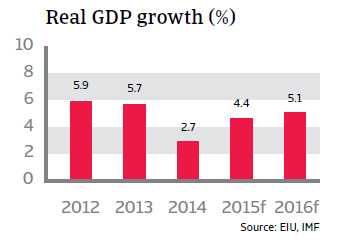 In each year from 2010 to 2013 Peru registered high annual GDP growth rates of about 6% or more. Growth slowed to 2.7% in 2014, mainly the result of decreased commodity prices. However, due to a strong fiscal position, with regular budget surpluses and low government debt of less than 20% of GDP, the government has room to stimulate growth with higher spending on capital investments and social programmes. In 2014 inflation increased above the Central Bank´s target rate of 1% - 3%, but is expected to drop below 3% again in 2015, due to lower oil prices. To support growth, since mid-2014 the Central Bank has lowered the benchmark interest rate several times, most recently to 3.25% in early 2015. This measure, along with the completion of two mega mining projects, strong domestic consumer / investor demand and public investment in infrastructure projects (power, housing, sanitation), are expected to accelerate economic growth by 4.4% in 2015. 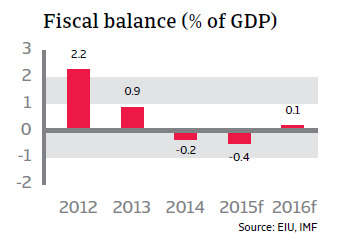 To sustain high growth rates going forward, the government needs to step up structural reforms (e.g. reduce fiscal system state bureaucracy, strengthen judicial system, reduce rigidity of labour market, improve infrastructure / education). While the Humala administration has made some progress further steps could be difficult as the government lacks an absolute majority in parliament. Peru’s liquidity situation is very strong, with international reserves amounting to more than 18 months of import cover - more than sufficient to cover external financing needs. 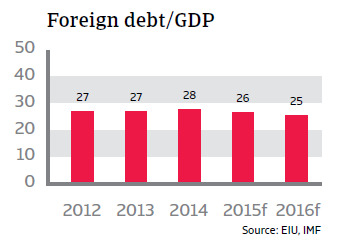 Solvency is under control, despite increased external borrowing by the private sector, as foreign debt is expected to amount to 26% of GDP in 2015 and debt service is manageable at 15%. The current account deficits are moderate and to a large extent, but no longer fully, covered by foreign direct investments in the mineral / mining sector. 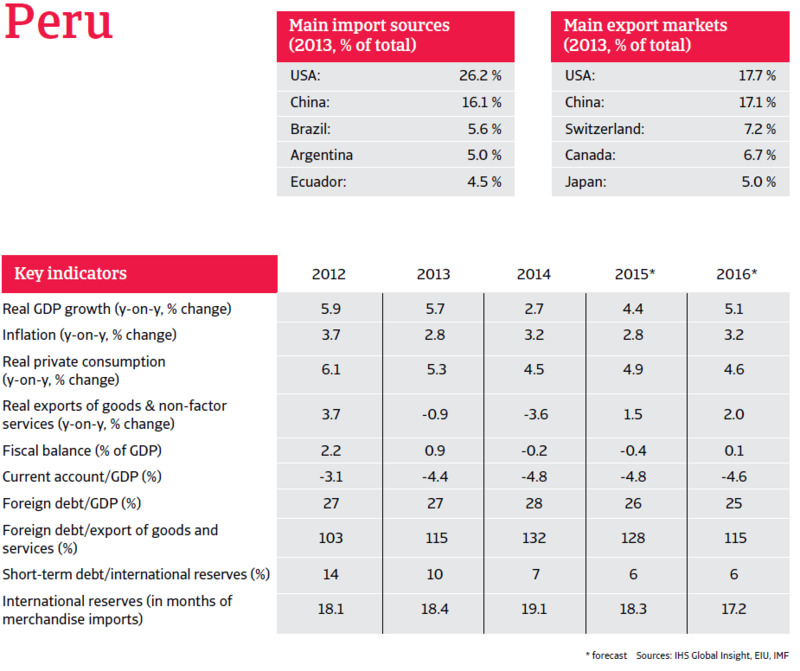 The solid liquidity and solvency ratio bolster Peru´s resilience against external economic shocks. Main risks to Peru´s economic outlook are a hard landing of the Chinese economy and growing social unrest in the mining sector, which would negatively affect the investment climate. At the same time Peru’s small, but well-capitalised and supervised financial sector is highly dollarized (i.e., the USD is preferred in large transactions and in savings, leaving it exposed to potential currency risk. 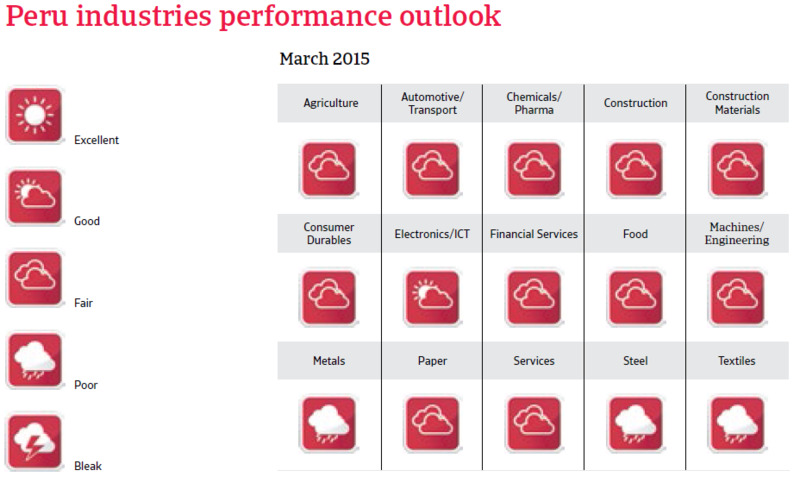 A sharp Chinese economic slowdown will affect countries through their exports and commodity prices. Especially countries in Asia and Africa are vulnerable. 33.5% of respondents in Brazil reported that maintaining sufficient cash flow levels will be their biggest challenge to their business profitability.